In some areas of the lower Willamette Basin groundwater is abundant. Groundwater also isn’t as expensive to treat and leaves valuable surface water in our streams for fish and wildlife. This option would involve developing a well field, from an existing aquifer, in either western Multnomah County or eastern Columbia County. Groundwater would be piped to a treatment plant near Cornelius Pass and delivered to Washington County customers. The drinking water providers would then work with Clean Water Services to meet its future water needs from Hagg Lake. Initial results have determined that water quality is adequate to meet drinking water needs. Currently, both Portland and Vancouver, Washington, use this aquifer as a source of drinking water. Due to the urbanized nature of this region, the Study is conducting a more in depth analysis of the water quality in this aquifer. The results should be available by the fall of 2011. The study is developing cost estimates for this option. Results are expected in fall of 2011. While groundwater is relatively clean, a filtration treatment plant or ultraviolet treatment plant may still be desirable to maintain a high level of drinking water quality. 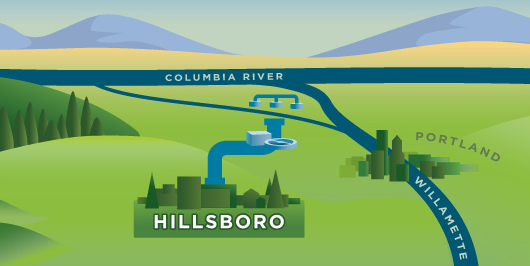 Water would be pumped from the well field up to a treatment plant on Cornelius Pass and then would be delivered by gravity to Hillsboro customers. Additional source water storage is not required under this option. Treated water would continue to be stored throughout the JWC distribution system in agency-owned reservoirs. Some of the water would also be injected and stored in aquifers during the winter. The water would then be recovered and used during the summer. The Study has determined that there is water available in the aquifer in western Multnomah County. The extent to which there is enough water to meet all of Washington County’s future needs is still being determined by the Study. Additionally, the JWC would be required to purchase or otherwise acquire the appropriate amount of property to construct a well field and secure the appropriate water rights. Land would have to be purchased to develop a well field. The amount of land would depend on the productivity of the wells. With higher productivity, fewer wells would be required. A well field is a compatible use with existing land uses in Western Multnomah County. Additionally, a pipeline can be sited by acquiring easements, using the public right of way, and utilizing the public utility facility siting statute.